Another Tuesday and another challenge from Everybody Art Challenge. This week we have an excellent sketch for you to follow. This week I have kept my card simple. It probably has something to do with it being a masculine card. I don't know about you but I find it very difficult to embellish a masculine card. It is always brads or stars but this week I have used cogs and gears - peel offs. Usually I don't use peel offs but these were particulary nice and suited the card. They are from a company called Craft Creations. I have used Copics for the image together with Basic Grey papers. The cogs and gears have been mounted onto actetate, cut out and positioned in various layers. 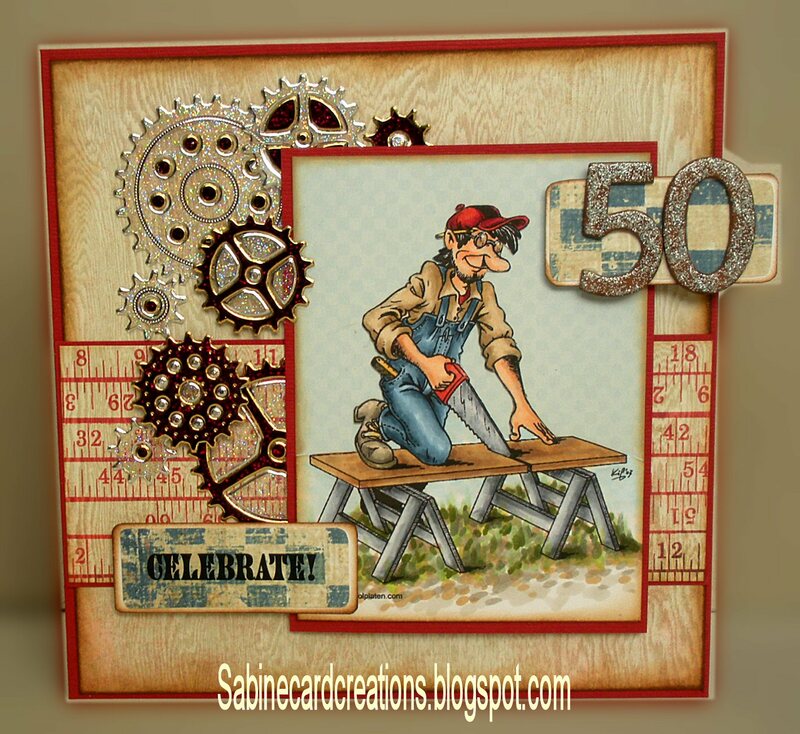 This card is for my Brother-in-Law who will be celebrating his 50th birthday next month. Deine Karte sieht ganz klasse aus! Das Motiv ist originell und witzig! Der Empfänger wird begeistert sein! Wow Jenny,love yourmale card and those peeloffs are stunning too! what a brilliant idea to use peeloff cogs on acetate. It's a fantastic male card - you're so clever! I've just bought die cut gears, so you've really inspired me to use them - thanks so much. btw: I found the blog we were looking for at the copic class: " a touch of Magnolia" - I see exactly what you mean about the backgrounds - they make you drool! Fantastic detailing- terrific Masculine card! WOW! !